A commonly voiced frustration when you get a group of project managers together is dealing with gold-platers. To them, a gold-plater is someone who cannot finish their work and release it to the client. They have to keep refining it and polishing it until it is perfect before they let it go. This perfection comes at the expense of effective delivery. It causes frustration because the team can’t deliver to the client on time. Plus you deliver much more than the client actually asked or (critically) will pay for. From the customer perspective, the long-term benefits of a higher spec product don’t compensate for the immediate issue of a missed deadline. 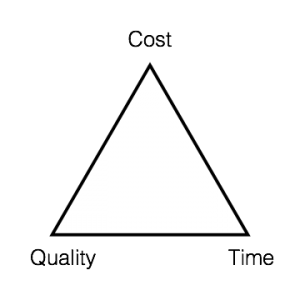 From a team perspective, it increases the cost of this project and stops you starting the next one. Gold-plating is often a matter where you look at the problem from. As a developing business analyst, I was reluctant to let specifications leave my grasp until they were perfect. I prided myself on the quality of my work and I didn’t want someone to think this was the best I could do. Also, I had been bitten before. People forget or never know that the original request was for a quick overview. Six months down the line I would get moaned at because a document was unclear, incomplete, or inconsistent. Which I knew. What was fit for purpose then, was no longer so. We are taught from a very early age to always strive to do and be our best. At school and all through higher education, only our highest quality work is good enough. We are not taught how to identify which parts of that work are the most valuable and to focus on those when time is tight. The approach commonly called the Pareto Principle. It is not surprising then that many of us have to learn this when we get arrive in the world of work. Here the measure of quality is what a customer is willing to pay for, and not always the best that a product could possibly be. Gold-plating is frequently based on legitimate concerns. I’ve already mentioned people gold-plating to mitigate the risk that they may be judged on the quality of the output and this may come back and bite them later. It is hard to build on shaky foundations when everyone has conveniently forgotten the tactical decisions made at the time. There may be a concern that the delivery won’t provide what is needed. Experience leads them to believe they know better than the client what is necessary. 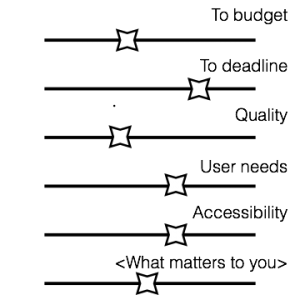 Other concerns may relate to personal autonomy. For example, the loss of control that happens when you hand something over to someone else to use. It invites challenge and change and not everyone welcomes that. Some may even avoid completing a project where they are an expert, to delay moving on to something new where they don’t know what they are doing. Your job as a team lead is to work out what is constraining your team member and help them move past it. So what to do? 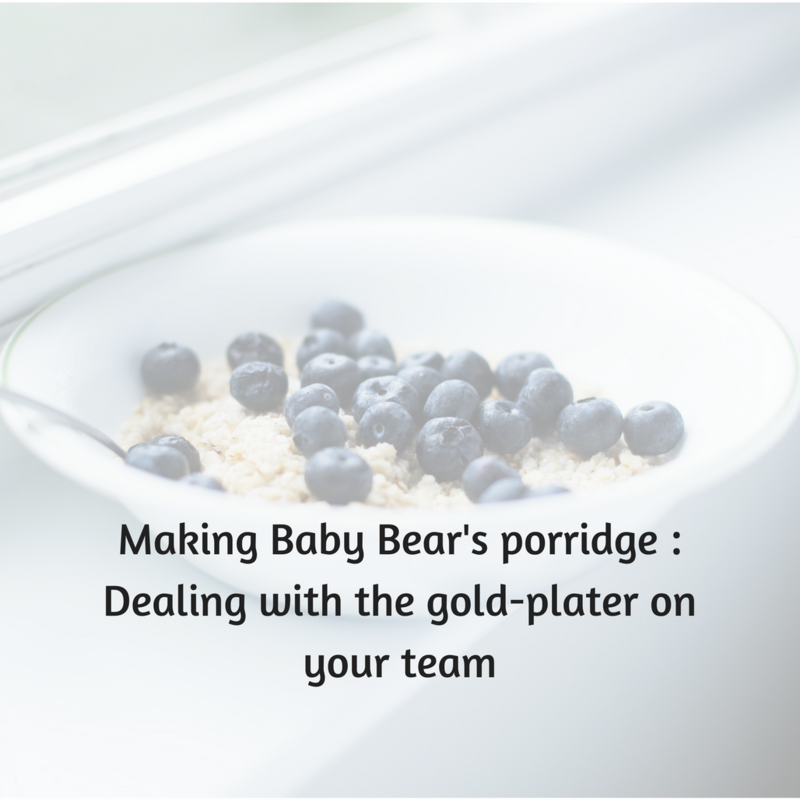 Getting the quality of a delivery just right, like baby bear’s porridge, is necessary for any project. How can you help not only your team understand but also your clients and stakeholders? When your gold-plater is concerned about the later impact of decisions then a useful model is the cost, quality, time triangle. The simple message here is “Pick 2 and compromise on the third. A really nice extension of this is Project Success Sliders. This allows more parameters to be considered, but the basic explanation is the same, you can’t have everything a. A project with all sliders over to the left will fail. A project with many things over to the left is high risk. Compromises must be made and these will impact one or all of the cost, time or quality. The illustration here indicates that budget and quality will be flexed to allow user needs to be met in the time scale (whatever that is!). These compromises are the risks and potential issues that you agree to manage. Spelling your choice out explicitly helps gold-platers feel more comfortable about handing something over before it is as good as they would like. The visual representation gives your team the security that the customer understands what is being delivered. It really comes into its own 6 months or a year down the line when your clients, stakeholders and yes, even you, have forgotten what compromises you agreed to get to your first delivery…..
One of the benefits of a gold-plater is that they set high standards for themselves and are unlikely to release sloppy work to the customer. They often benefit from an external perspective on what good enough is, and how to recognise it. Do you have any people who are really good at getting it just right, that you can ask to mentor people? You need to have your team’s backs, but it needs to work both ways. They need to help you deliver. So have I got rid of my tendency to gold-plate things? Pretty much, yes. I now prioritise rigorously and remind myself that “Done is better than good” on a regular basis. How do you manage your gold-platers? This entry was posted in Behaviour. Bookmark the permalink.